TODAY ONLY! 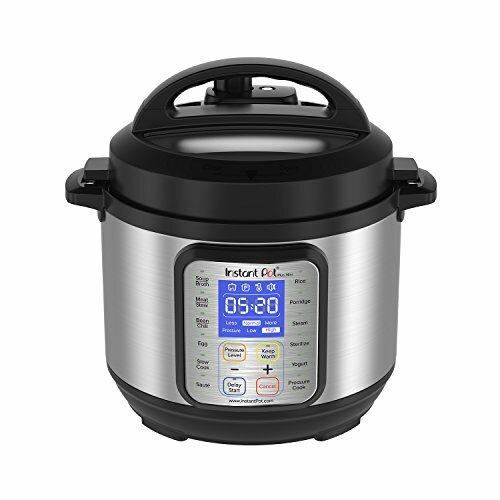 Instant Pot Duo HUGE SAVINGS!! Duo Plus Mini, the ideal companion to the Duo Plus 6 Quart, combines 9 kitchen appliances in 1, Pressure Cooker, Slow Cooker, Rice Cooker, Steamer, Sauté, Yogurt Maker, Sterilizer and Warmer. Prepares dishes up to 70% faster saving you time and energy in your busy lifestyle. Features 13 Smart Programs - Soup/Broth, Meat/Stew, Bean/Chili, Sauté, Rice, Porridge, Steam, Slow Cook, Yogurt, Keep Warm, Sterilizer, Egg Maker, and Pressure Cook, your favorite dishes are as easy as pressing a button. Built with the latest 3rd generation technology, dual pressure settings, 3 temperatures in Sauté and Slow Cook, up to 24 hour delay start, automatic Keep Warm up to 10 hours, and sound ON/OFF. Stainless steel (18/8) inner cooking pot, food grade 304, no chemical coating, 3-ply bottom for even heat distribution, fully sealed environment traps the flavours, nutrients and aromas in the food. UL and ULC certified, 10 safety mechanisms to provide users with added assurance and confidence, designed to eliminate many common errors.